UV degradation can be a primary factor in signs substrates yellowing over time. The simulation shown easily demonstrates how other styrene facers can quickly degrade and yellow simply from exposure to interior lighting. UV degradation occurs due to oxidation of polymers within the plastics that make up sign substrates. Substrate yellowing is also known as photodegradation. The potential yellowing of sign plastics should always be a consideration when selecting sign materials for your business. The polymer oxidation process results in the formation of free radicals that initiate color change. The appearance of these new molecules cause light to be reflected differently (primarily within the yellower colors of the light spectrum); causing your sign plastics to appear yellowed. How Can I Keep My Signs from Yellowing? As with any sign substrate, the quality of core raw materials utilized in manufacturing is key. The components used in making sign facer styrene have properties such as whiteness and opacity that can affect how UV light interacts with the polymers of the material. Higher quality materials assist in creating a more substantial barrier that protects against light permeation below the face of the styrene, leading to photodegradation and rapid yellowing. If your sign plastics are showing signs of yellowing, look to a manufacturer with a reputable styrene facer like UltraBoard Classic or UltraBoard Lite; or manufacturers that utilize high quality raw materials or UV-absorbing stabilizers; also known as quenchers or HALS (Hindered Amine Light Stabilizers). Light stabilizers assist in restricting free radicals formed by UV exposure, aiding in yellowing prevention of sign substrates. In our UV exposure tests we have found that some boards can begin to yellow after only 60 days of exposure to interior lighting. Not an ideal result for long term signage installations. Our UV degradation simulation easily demonstrates possible results with competing styrene-faced foam boards; specifically if signage placement is near exterior windows where outdoor UV exposure can be more intensive. 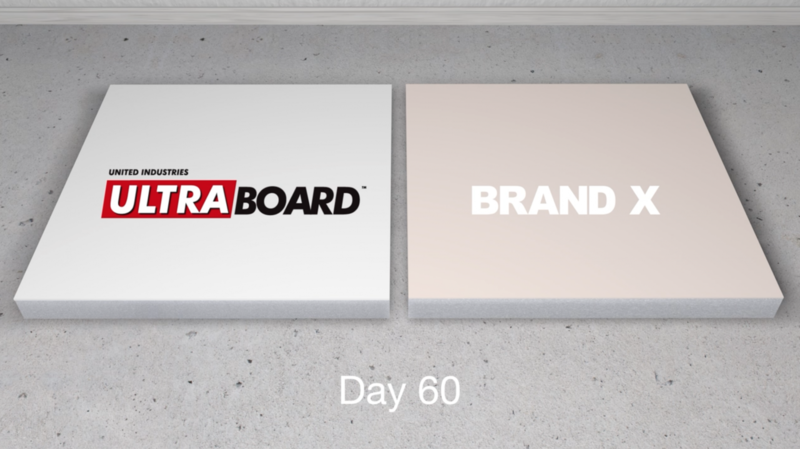 By comparison, our new UltraBoard Lite foam board can show no signs of yellowing from UV exposure for up to five years; making for a worry-free sign sign substrate that your clients will be happy with for years to come. This entry was posted in Commercial Signage, Digital Printing, Large Format Printing, Retail Signage, Sign Business, Sign Design, Substrates and tagged degradation, plastics, signs, styrene, UV, yellowing.